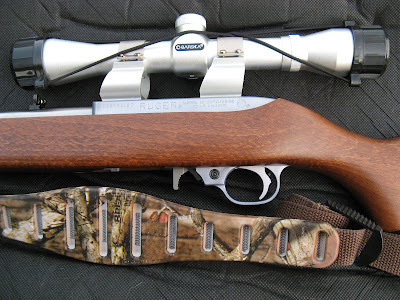 FALIA REVIEWS: I love my Ruger 10/22 !! I love my Ruger 10/22 !! I hardly-ever buy anything major at a gun show, but man did I luck-out at the last one I went to... I found my very own Ruger 10/22, and it was exactly like I had wanted - a beautiful hard-wood stock and a stainless barrel. BRAND-spankin' new, for $225. It is an older model (2005), so it actually has the original metal (aluminum) trigger guard, as opposed to the plastic one that comes on the current Ruger 10/22 that you will find in the store. 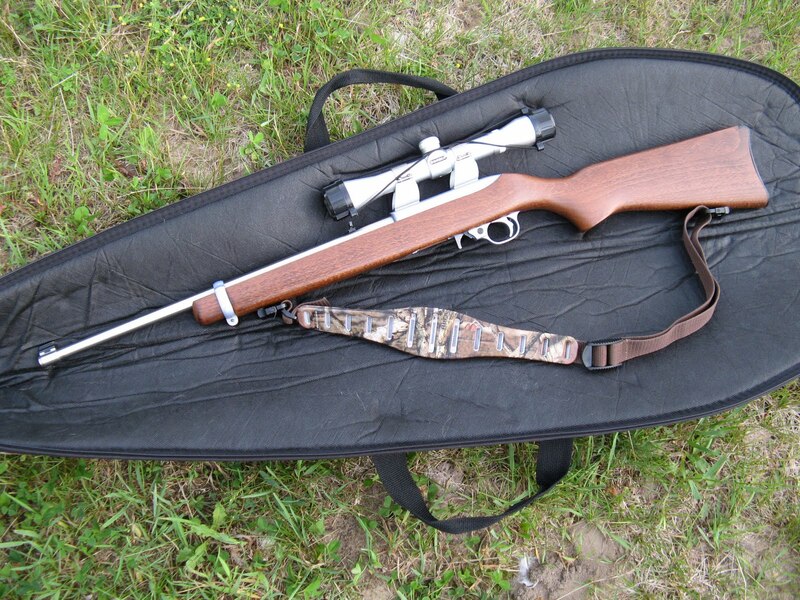 For those of you who don't know, the Ruger 10/22 is semi-automatic rifle that shoots .22 LR ammo. It has basically zero recoil, excellent quality, is simple to use, shoots inexpensive ammo, and is a simply gorgeous rifle (of course this is a matter of opinion, but I sure think so...) It is one of the most customizable rifles that you can buy, mainly due to its popularity - In other words, they have come out with tons of after-market modifications to change the look, improve the performance, increase the magazine capacity, etc. Don't like the stock? Switch it out to a different color or, better yet, a Butler Creek folding one. Want to go thru more ammo than the original factory 10-round magazine? Get a Hot Lips 25-round magazine or a tri-mag magazine coupler that will hook three 10-round factory mags together! There is even an entire book you can buy, all about how to Customize the Ruger 10/22 . I really do believe that it is the perfect first rifle for a beginner, but honestly they are not simply for beginners. In my opinion, everybody who owns a gun should have a .22 rifle, whether it be a pump-action, bolt-action, lever action, or semi-auto. They are all great for plinking, shooting small game, and blowing thru cheap ammo for practice. My dad actually has a Mossberg bolt-action .22 rifle that is alot of fun to shoot, and I especially love the fact that his has a peep sight (EXTREMELY accurate). Had one of those ages ago with black barrel etc. Bought a figured walnut stock for it with a cheek rest. Nice! Yes 22 rifles are a must in this day and age. Since I love the AR platform and its what I am most familiar with I went and bought a S&W M&P15 22. Its is a rifle that puts a huge grin on my face every time I shoot it. Can't wait to one day get a can for it. the other thing is you can do drills with it with out breaking the bank. Now that has to be one of the nicest 10/22 setups that I've seen in years. Much more useful than the so called "tacticool" firearms a lot of folks have nowadays. 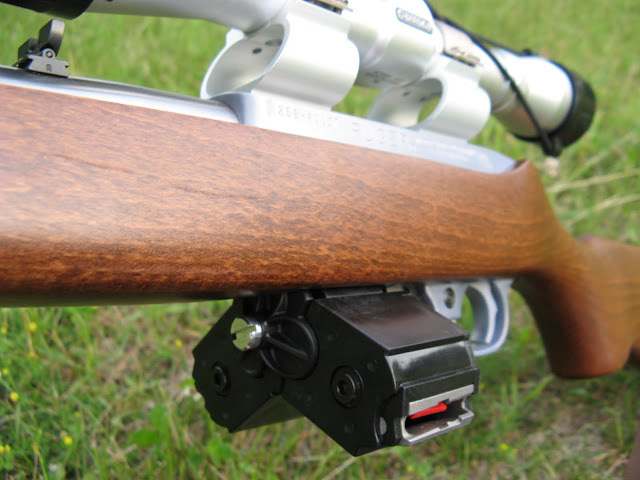 Your writeup on the advantages of the .22LR is spot on. Economical to shot and works for self-defense in a pinch. Some gun snobs disagree but I won't get started on that topic. Safety first and congratulations on the purchase! That is a fine weapon, (I love the contrast between the wood stock and the scope) and yes a classic! Sweeeeet rifle! I love my 10/22. 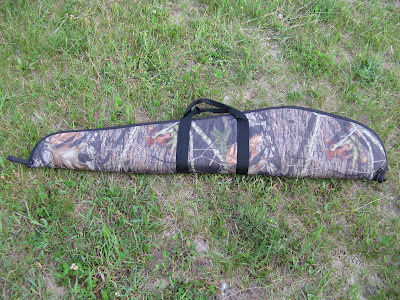 I actually got it for my stepson--who is a natural--but he has no interest in shooting, so...woo hoo! The versatility of this model and the availability of aftermarket parts/mods makes it an ideal rifle. And yep--cheap and fun to shoot! Todd - thanks! Yeah I thought silver accessories would match the wood stock better than black ones. I really love how it turned out with everything on it. Anon/wild lupine - no interest in shooting? well, maybe someday.. lol. Until then, enjoy it yourself! thx for the comment, good to hear back from you, I loved that gun post on your site. I guess I must live in a cave because I have never seen those tri-mags like that. Neat! Mykki - well, being in a van, I live basically in a cave too. lol. 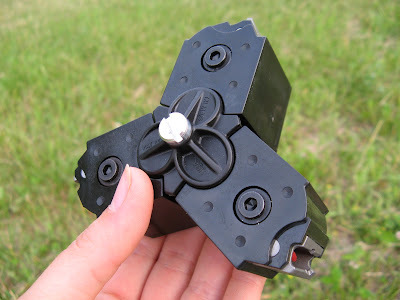 Actually I didn't know about the tri-mag coupler until I was searching online for 10/22 accessories. I think they are fairly new. I squat in a house that my church owns, (without utilities) so I'm not far behind ya sister! Mykki - yeah, that is probably quite a bit like being a van, being with the lack of utilities and all. Pretty much the same off-grid roughin' it, just a little less mobile. Do you have a vehicle? No Ma'am. Sold the car to go to Haiti, which is on hold til next year most likely, because of the earthquake. "Roughing it" is mos def what it is with this Indiana humidity. July 4th will mark 3 months I've been doing this. laptopandarifle - nice! how many rounds can you have loaded at a time? Mykki - man I would feel so trapped without a vehicle. hang in there! You said "They are all great for shooting small game". You, of all people, shoots living creatures for fun? Wow, I'm speechless and more than a little disappointed. Somehow it betrays everything I imagined you to be on account of your very insightful and inspiring writings. Bummer. Meta - no, I would never shoot living things for fun! I am in the survival mindset, so I was talking about shooting small game for food, to eat. I've never killed anything and don't know that i really could. Actually I take that back, I did shoot a mouse to put it out of it's misery b/c it was not fully killed by a defective mouse trap and was suffering. Anyhow, if I was starving in a survival scenario, I would use my 22 to shoot small game. I do love animals and believe that all life is sacred. I DO NOT encourage shooting small game for fun. I tried being a vegetarian before and decided it is ultimately not for me, so if I'm going to eat meat, I should be able to kill it myself. Just haven't yet. That's really good to hear, I am so relieved. And thanks for taking the time to respond, I obviously misread what you wrote and therefore owe you an apology. I'm not a vegetarian myself but would probably starve to death if I had to hunt for my survival. I love your blog by the way, and your writings show me you are a truly beautiful person inside and out. Thanks again my friend. I also have a Ruger 10/22 scoped. Great gun. Finding places to shoot is tougher. Gun ranges charge quite a bit. I decided to purchase a .177 pellet gun. It is multiple pump and shoots a .177 pellet at 800 fps. It will take down small game too. No loud report either. Peter - I think everyone should have a 10-22 in their collection. Such a great gun :) Thanks for the comment. Hopefully ammo becomes more readily available soon so we all can get out more. I'm sure I could burn through my stash pretty quick if I wanted to. Have you picked up any of the Ruger BX-25 mags? They're pretty heavy compared to other mags, but they're super reliable and they're screwed together so you can take them apart and clean them, or make repairs to them if need be. You would have to be pretty rough on them though to break them. They're tough rascals. Great review about a great American Rifle. I have the 10-22 like yours as well as a 10/22 I-TAC 22LR TACTICAL TALO BLACK. There are several very fine .22lr rifles like, for example, the Marlin 60 just to name one. But the 10-22 sets the bar quite high with both its unparalleled performance and the amount of readily available accessories.